Norbain is pleased to offer the latest addition to SSP’s range; a colour door entry system. The SSP-VCKPK is a low-cost colour video door entry kit that’s packed with high-end features normally associated with branded, more expensive alternatives. The kit comprises one weatherproof outdoor station and one 7″ wall-mounted touch screen colour monitor (complete with 3-pin plug-in power supplies). The outdoor station has an illuminated touch sensitive keypad for programming functions and PIN-code entry, a proximity reader for card/fob entry, and a call button for visitors to announce their arrival. The high-resolution camera has a motion detection sensor with the ability to automatically start video recording. Should a visitor receive no response, there is the option of recording a voice message on the system. In addition to viewing visitors at the door in real time, and recording images and video, the 7″ colour monitor is also used to navigate and adjust the user settings via the intuitive touch screen menus and control the lock ‘open’ command; plus, it enables 2-way audio communication with the visitor. The monitor is equipped with a Micro SD card slot, which enables up to 32GB of extra storage space to be added (recommended for still image capture and video recordings). In standby mode the monitor displays day and date in a digital clock format. The kit is easy to install, requiring just a 4-wire link between the outdoor station and the indoor monitor. A timed volt-free relay output is provided for activation of an electric lock (time delay is selectable via a user menu). If required, the basic kit can be expanded with a further outdoor station, up to four indoor colour monitors and up to two additional surveillance cameras. Additional monitors enable intercom communication between each of them; a useful facility to have in a large office or house. 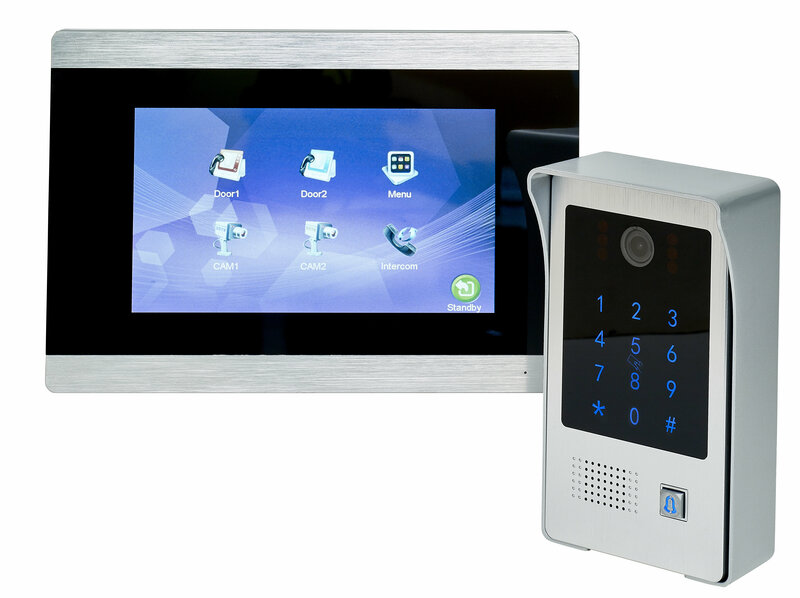 The SSP-VCKPK door entry system is a versatile unit, offering an impressive array of features, at an affordable price.